Firstly, congratulations to the coach, his technical staff, the captain and his players on a job well done. There is still a long road ahead but it was certainly a step in the right direction. How was the players’ mind-set when they arrived in camp? I am unable to comment on this as the players arrived at camp on Sunday and I first worked with the squad on Thursday. What I can say is that the vibe was positive when I met them for the first time. When you arrived, was their mind-set due to the losses to Cape Verde and/or something else? The losses to Cape Verde were a very frustrating issue for the whole squad. The players were hurting after those two losses and were very eager – almost too eager – to put things right. What did you work on during your sessions? When you’re on the back foot the key is to keep things simple. The objective was to assist the players in letting go of the past, shifting focus from the future – Russia specifically – and instead target the present moment. What kind of exercises did you give them to get them in the right frame of mind? As I mentioned earlier, the key was to go back to basics mentally. We knew exactly what outcome was required so the focus shifted to our processes – what do we need to do to achieve the required outcome? This entailed examining what was required of each unit – keeper and defenders; midfield; and attackers – in terms of their processes. Basically, this means focusing on your core role within the team and targeting just that. What did the sessions entail? The focal point was to create a “here and now” mind-set which was critical to achieve success. So, the intervention entailed exercises to achieve this objective. This included re-evaluating what the responsibilities were of each player as an individual; as a unit; and ultimately as a team. What has the impact of social media been on the team? Social media can have an enormous impact, both positively and negatively. The outpouring of negative comments on social media leading up to the game said to me that the fans still cared about the successes and failures of Bafana as opposed to feeling indifferent. So, looking at a negative aspect and finding the positive was important. However, this will only work temporarily. Obviously we would like positive messages of support and encouragement as this contributes to creating some really positive momentum. Did you ban social media from the camp or is this not necessary? This decision rests with the coach. However, during the course of our discussions we acknowledged that apart from being impossible to implement, it wouldn’t be the correct thing to do. The players are professional athletes and it’s their responsibility to manage their social media interaction. Given much of the commentary leading up to the game, I think the players did a very good job in this regard. How can the public help the players be in a good frame of mind? I fully understand and appreciate, as do the players, the frustration and disappointment of the fans when things don’t go according to plan. And it makes a huge difference – it is not something that the players take lightly. As I mentioned earlier, they were almost too eager to get the victory against Burkina Faso and restore the public’s faith in them. All teams and athletes go through phases of dips in their performance. It’s at times like these that I would request the public to really throw their weight behind their national team. I know it would add immense value to the team. Are our players mentally weak and easily distracted? Definitely not on both counts. The pressure couldn’t have been greater going into the match against Burkina Faso and the players stuck to their processes throughout and got the result. Any international athlete or team is under permanent pressure: If you’re winning you have to continue winning; if you’re losing you have to start winning immediately and continue winning. This can lead to a situation where the team becomes so desperate to win that the focus moves away from their key processes and zones in on trying to fix previous errors and thinking about the future. This leads to distraction from what is required in the present moment. Are there more sessions planned or was this a one-off? 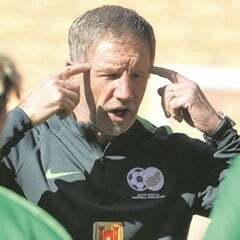 This decision rests with the coach and Safa [the South African Football Association]. Personally, I am committed to assisting the national team wherever I can. I understand the frustrations and disappointments. Please remember that creating long-term, consistent success is a collective effort with many bumps along the way.